Don't miss DCI.org's LIVE WebCast of the Coltrin & Associates DCI Southeastern Championship from Atlanta, Ga. this Saturday, July 14. The WebCast will feature all competing units from afternoon and evening performances, broadcast live to you on the Internet from the confines of Atlanta's Georgia Dome. Don't miss this exciting opportunity for unprecedented access to the live performances of 19 Division I drum corps. All times Eastern time zone and subject to change. 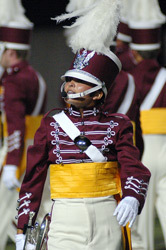 Corps performances will be shown in a multi-camera broadcast format. 11:45 a.m. Afternoon WebCast and live customer support begins (for Platinum members and Pay-Per-View) 12:00 p.m. First corps performs 3:44 p.m. Afternoon scores announced 3:50 p.m. Afternoon WebCast ends BREAK 5:45 p.m. Field Pass Live WebCast begins (free to all DCI.org viewers) 6:00 p.m. Field Pass Live programming starts 6:30 p.m. Field Pass Live ends 6:45 p.m. Evening WebCast and Live Customer Support begins (for Platinum members and Pay-Per-View) 7:00 p.m. First corps performs 10:44 p.m. Awards ceremony 10:55 p.m. Encore performance (high camera angle only) 11:10 p.m. Evening WebCast ends View the competing drum corps in order of appearance. Two options are available to view this WebCast. DCI.org Fan Network Platinum Members have full access to LIVE WebCast events all season long in addition to other exciting benefits. Sign up today for a Fan Network Platinum Membership. Those wanting to view just the Coltrin & Associates DCI Southeastern Championship WebCast can purchase the single event Pay-Per-View option. Purchase a Pay-Per-View pass to this event. Just added to the schedule, an EnCorps! Video presentation of full corps performances from this event, will be available Wednesday, July 18. EnCorps! 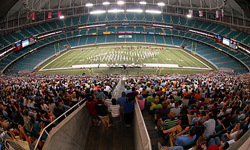 Video is available exclusively to DCI.org Fan Network Platinum Members. DCI.org technical support will be available online just before the beginning of each WebCast to assist those who may experience technical difficulties prior to the start of performing corps. Please review this list of frequently asked LIVE WebCast questions before purchasing a Pay-Per-View pass or Fan Network Platinum Membership to view this event. View all LIVE WebCast events scheduled for this summer.